It has been thirteen years since the last (and only) time I have been to Disney World. My aunt and cousin wanted to spend our one day in Magic Kingdom, and I agreed, despite my memories of it being a little boring. I wanted to indulge in my love of travel in Epcot or maybe enjoy the shows in Hollywood Studios, but they promised Magic Kingdom would be worth it. It was fun enough. We rode famous rides like “Peter Pan’s Flight” and “It’s a Small World.” I couldn’t shake my adult cynicism, however, and I made my mom listen to comments about the subtle racism of a majority-white puppet world. I liked the puns made by the “Jungle Cruise” operator (“What is the scariest plant? BamBOO”) and I enjoyed climbing through “Swiss Family Treehouse.” But nothing had awakened my childlike glee since boarding the ferry that took us from parking lot to theme park. Nothing, that is, until we avoided the mid-afternoon heat by escaping into seated, air conditioned shows. “Is Mickey’s PhilharMagic like Fantasia?” I asked. “Yeah, kind of,” my cousin lied. We put on our 3D glasses, and my heart exploded. Donald Duck stole Mickey’s magic hat and wound up traveling through the worlds of Beauty and the Beast, the Sorcerer’s Apprentice, the Little Mermaid, the Lion King, Peter Pan, Aladdin and Jasmine. Famous songs were re-enacted with the added twist of a confused duck crashing through the scene. Part of what I Ioved was the innovative 3D. More than most theme park shows, the 3D was both believable and fun. Donald reached out to the crowd as the magic vortex sucked him in, and half the audience (myself included) tried to save him. Ariel flung jewels at us, the cleaning broomsticks splashed us with water, and Simba roared into our faces. At one point, while singing “Wish I could be part of that world,” Ariel stretched her arms toward the audience, eyes large and beseeching. The man directly in front of me leaned forward and held his arms out to the screen, so close to the cartoon mermaid, and yet so far. More than the technology, I was giddy on the songs. I realized that what had been missing in all our previous rides and adventures was personal attachment. But The Lion King? Aladdin? 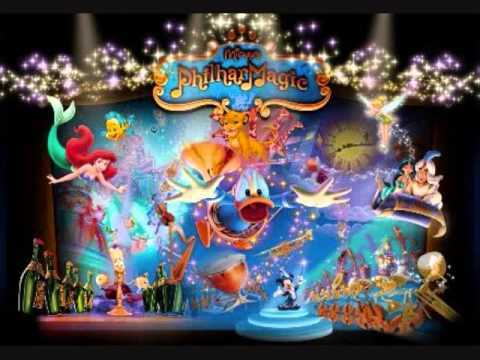 The movies in “Mickey’s PhilharMagic” were the movies of my childhood. I knew every word of the songs, and I took such delight in seeing beloved characters interact with Donald in increasingly silly ways. When the show ended with a majestic orchestral “M-I-C-K-E-Y M-O-U-S-E,” my heart was full. 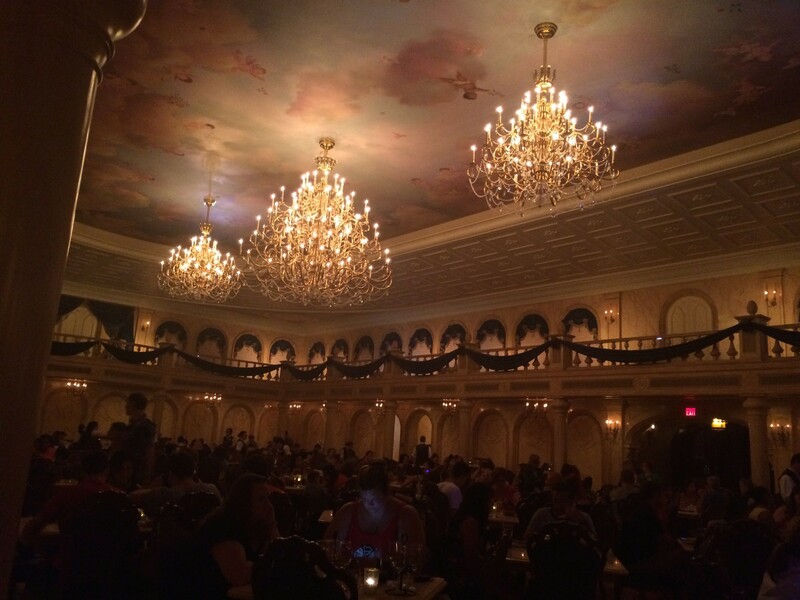 My cousin Bess had eaten at “Be Our Guest” on a previous visit, and she made reservations for us there at 9:55 p.m. It was going to be our last stop before the castle’s light show, and we had already been in the park for fourteen hours. We were all hot, tired, and footsore. Night had fallen, and we waited on the bridge for a hostess to let us in. I dragged my feet as we got to the doors that magically opened for us…into a castle. My eyes widened. “The ceiling is the same!” I whispered to my mom as we walked into the wide ballroom, filled with tables but otherwise the same as the animated movie’s set, marble walls and giant chandeliers. We had already had dinner, but I ordered a glass of Enchanted Rose wine and “The Grey Stuff,” which was, indeed, delicious. “What is your favorite Disney movie?” I quizzed my family. “What’s your favorite Disney song?” Here at last was my obsession-fueled energy, thrilled to find myself living in a fairy tale and desperate to extend the experience. “It’s snowing outside,” my mom said, pointing at the windows magically portraying a winter wonderland. “Oh my word,” I breathed, sighing in happiness. We ate, took pictures of the Prince’s slashed portrait in the West Wing, and stopped in the room where the Beast waited to pose with visitors. “I’m going to ask him to dance,” I bragged to my family. We got closer to the front of the line. “No, I’m not, just kidding. 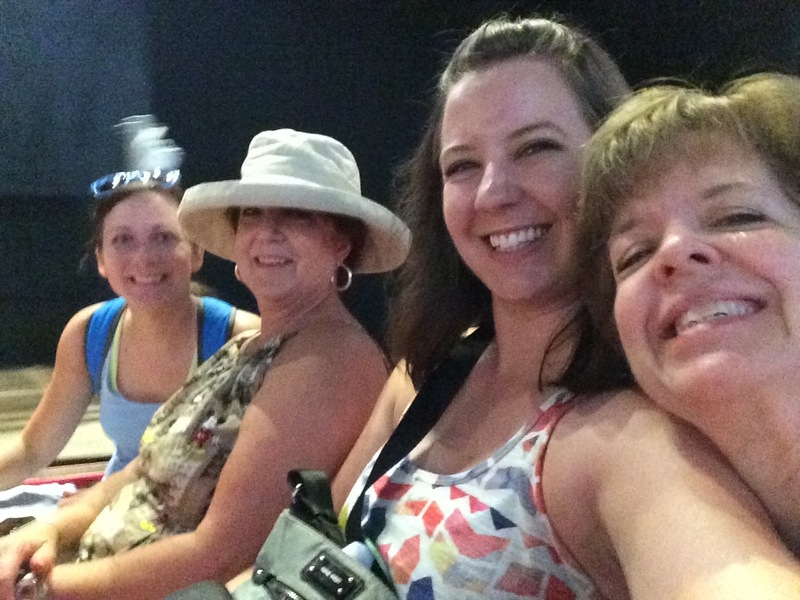 We can all just go together.” My mom ignored my nervousness and pushed me forward. He shifted, facing me and holding out both arms. I grinned and took his paws. He moved me side to side, then lifted one hand and spun me in a circle. Pulling away, he bowed deeply, and I whispered, “Thank you,” with shining eyes and a smile I couldn’t get rid of. 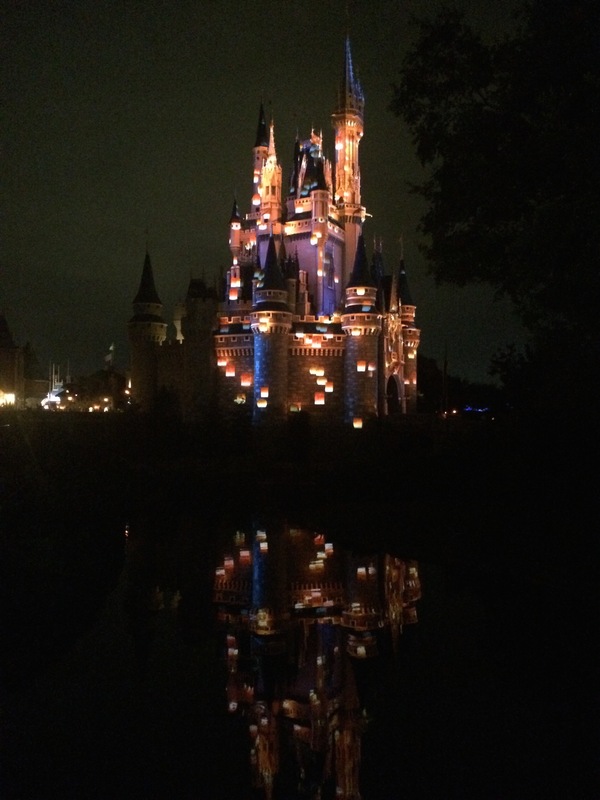 We hurried from the Beast’s castle to Cinderella’s, just in time to see its walls light up with pictures of famous Disney scenes. 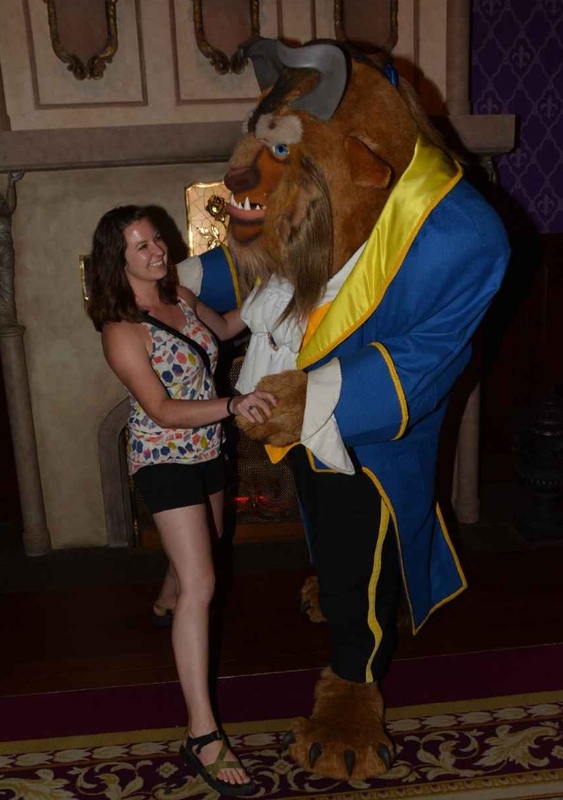 I gaped at it all, the Disney magic pumping hard through my veins. Then Walt’s face appeared, saying, “I only hope that we don’t lose sight of one thing – that it was all started by a mouse.” Mickey materialized in a wheel of colors, the music swelled, and fireworks exploded in the sky above us. Previous Article New Travel Page! Omg, I feel less special now knowing that every Jungle Cruise instructor does hilarious puns, haha. Also, I’m so upset we didn’t do Philharmagic when we went! I didn’t know what it was and we didn’t go in. Another thing to do next time! 🙂 Your description of Be Our Guest literally gave me goosebumps. It sounds absolutely incredible. Philharmagic WAS great. I wish it had a different name because, like you, we almost didn’t go! It was definitely my favorite show (we were only at Magic Kingdom).